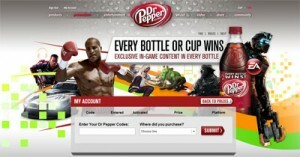 This year, Dr Pepper has a new game on codes and cups: Every Bottle Wins – where you can redeem your codes for various items, including EA games downloadable content. Pretty cool stuff. I drink plenty of Dr Pepper, and don’t really have a use for the EA games stuff, so I’m going to start posting the codes under the cap here, on the comments on this page. Like the latest MyCokeRewards code sharing page, I’d expect some other generous folks to pitch in as well. We have a great sharing community here. Please, no begging. I leave codes at random times in the comments below. Begging doesn’t speed anything up. First code redeemed….NOT by me! But thanks anyway!! theres so many “my coke rewards” and barely any dr.pepper codes! C’MON GUYS! more dr.pepper codes! I’ve got a bag of these things and am not a gamer. BTW my son works for EA. Picked up his first joystick at the age of 2 and kept on going. haha same here! i checked it everyday on the holidays! and i went back to school and when i come back theres 3 codes and everyone has already redeemed them. Finally got around to cleaning up some of these. I hope to post often. Lexo- sorry about that. I should know better. I’ll try to be more careful. Probably had Coke codes on the brain; they use V and Dr. Pepper uses Y. My son works for EA and he told me he doesn’t know anyone who wants these codes, so I’m posting them here. Hate to waste anything I’ve collected! He started playing video games at the age of 2, and turned his passion into a lucrative career. LOL! Uh, how about some more codes? All redeemed by someone. I still waiting for 1 code. Hey, if redeemers don’t post, I may quit doing this. Its a simple, polite thing to do. They’ve all been redeemed by someone else. Please don’t stop posting Karen, there are still many of us who appreciate it and haven’t gotten a code! OK, try again. Please post – you don’t even have to use your real name! They’ve all been redeemed by someone else. Guess I’m the only one posting these. Having some vision problems so trying not to strain anything until I get checked out. Thanks Lexo for your concern. As I posted on the FreeMyCokeRewards site, turns out there were some leftover bits from the cataract surgery that moved around. Apparently its common, and they can zap it with a laser. It is a little scary when things go fuzzy however. vvhitekid2 your code is valid Thanks!!! But Karen code reedem by somone else. My friend Larry is still picking these up, so here’s a few more. all ready redeemed by someone else karen. Won’t be posting for about a week, off to Las Vegas. with Me, perhaps working with others ..
Wow there is so many generous people out there! Karen you like dr.pepper ? Fanthomas – Dr. pepper is OK, but I get the caps at a college recycling center while I’m hunting Coke caps and flaps. I just kept collecting them, but I’m not a gamer so I am posting them as much as I can. #89 RNBM 🙁 just a little late again it seems. All reedem by someone else 🙁 but thanks Karen! OK, I think I need a real vacation. And a trip to the eye doctor. I just realized I was using Pantene conditioner for hand lotion at night. For at least 3 nights. Now that we’re done laughing, here are your codes. Damn, still just need one to unlock the last fighter in Fight Night Champion. Here’s a fresh, new, FREE code for 200 more Battlefunds. I put the evil eye on anyone who takes these and doesn’t post! Enjoy all of the codes! Please post when you use codes. It seems people that use them dont post & the kind people that post & say thankyou anyway dont get the codes, so I hope a good person gets these & if someone uses them & dont post, then I hope your computer stops working when you are done. Thanks nitros dad, It was very kind of you RBM finally! #128 : i got the last 3, thanks so much! This website is amazing! Entirely unique, i’m suprised at the dedication and selflessness of all the people openly sharing these codes. I unfortunately live in the UK and can’t get my hands on any, so will be sticking around in the hope to score a couple:) Well done to those taking the time to share! 0tmzzadjm1pm I think it is right? OK, got a few cleaned up and ready to post. Thanks for posting when redeemed. i have the last. is rmb.thanks karen :)) the second is not valid :/ can you look after there please..
LDH0VRBP4Y6H – I think. That second to last character is only half printed. Have no idea why I thought it was a 9. As long as I’m here, a few more. #152 Karen RNBM thanks anyways. PLEASE POST RBM WHEN YOU USE. GOOD LUCK! #168 all redeemed, but I didn´t redeem them. ninjas….these people are all BFH ninjas. anyway thank you nitros dad. #181 Not sure where to get those codes..
where are the codes on that page? I’m going to try to post more often. We’ll see. thanks a lot for your generosity! i hope i could get some, i’d love that dr. pepper fridge in sims social. Thanks for being so generous anyways ! Last 3 RNBM 🙂 Thank you very much Karen.. Already RNBM… Does the store that you select change anything, because if not these go A LOT faster than the mcr codes. there probably gone by now………………. I forgot you have to put in a store. So dumb. Put in whatever, I have no clue where these came from. aww.. i have refreshed this page all day and still i couldn’t get a single code. 🙁 oh well, better luck next time. thanks for the code, karen. I WILL PUT SOMEMORE ON LATER TODAY. all codes RNBM. 🙁 thank you for your generosity, Nitros dad. AS ALWAYS PLEASE POST RBM WHEN YOU USE. GOOD LUCK! there all RNBM, anyway thank you Nitros dad. Thank you very much, Nitros dad!!! All have been reedemed unfortunately. From Russia With Love. Enjoy! If you need more code writing as unsubscribing to hear what codes are already used. P.S.Sorry for my English use a Google translator. None of the codes in #230, #231 and #232 are working for me. I’m looking for 5 codes to get the 5 dog tags for BF3. RBM THANK YOU VERY MUCH!!!! BTW, RussianSoldier, none of your codes have worked for me so far. I always get the error “please try again in a few minutes”. Even when they’ve been confirmed to be redeemed, I don’t get the other prompt. Thanks Fanthomas. I think I got 2 or 3. Can I ask where all of these codes come from? These are definitely not from caps, that I am used to seeing. Obviously, there is a pattern in these codes. And why is there a limit of 1 code per account, or we need a new account to use it? Just trying to understand. TIA. I’m giving them all away because way back when I entered one and it wanted me to sign up for something to do with EA games, that you get additional content for games that you own and play. My son who is actually a director at EA didn’t want them or know anyone who did, so I post them here. Karen, thanks. I knew most of the typical codes came from caps. But all those codes above, with the “AAL” in the middle of the code, did not. So I was curious as to where those came from. Diane, that is interesting. I hadn’t really looked at them. hope it helped. i wasted soooo much money. @Mike What you are saying is not true for codes from caps. For these other codes, that sounds right. But I want to know where those codes came from, and what makes them so unique and restrictive. Thank you Karen and Merry XMas to all! Thanks for posting. The first code is invalid. The rest were redeemed by someone else (RNBM). Looks like the EA site is accepting code redemptions until 31 Jan 2012. Cool if you still have codes to use up or share. Over 20 million members have joined My Coke Rewards. To celebrate, we’re showing our appreciation by giving away 20 of the most popular prizes from 3/14/13-4/11/13. Enter a 12-pk code to get your MCR points and a complementary sweepstakes. Plus, your first (5) five sweepstakes entries will earn you 20 Bonus Points. The promotion will run from March 14th – April 11th.